When I started my first job out of school, I knew managing our money was important. I understood that creating a budget was crucial for long term financial success. Unfortunately, our income was low and inconsistent. Months would go by and I would realize that it was impossible to stick to the budget I made! Years went by and we went more and more in debt. A budget felt like a punishment. We simply couldn’t stick to it! The more defeated we felt, the less we paid attention. Our financial situation did not get better. It got worse! I wish I would have understood from the start that a budget is simply paying attention. A budget is not a static tool. A good budget will change and adapt with our circumstances while helping us reach our long term goals. It took me a long time, many sleepless nights , and lot of trial error to learn this! Please don’t be discouraged if your current situation is frustrating and hopeless. I wish I had learned this earlier. It would have saved us a lot of headaches! We have followed all the steps below for about 10 years now and I have completely turned our life around. Let’s break things down step by step. This is exactly how we approach our monthly budgeting process! What is a monthly budget? The first step in budgeting is not beating yourself up on how much you spent last week or how low you perceive your income to be right now. Instead of looking budgeting as constricting your life, we like to look at budgeting as a road map. The first step in budgeting is dreaming. It sounds counterintuitive but stick with me. Think about what you want your life to be. What things would you like to own? What trips you do want to take? How much income do you want to bring in this year? In 5 years? 10 years? Don’t self-edit. Write it all down. Be honest. A budget is a road map to those dreams. It is not a punishment for how much debt you have or how much you overspent last year. How to get started with budgeting? All you need to get started budgeting is a willingness to learn and a mindset for change. Remember, this about progress over perfection. No one follows a budget perfectly. We all make mistakes. Fresh starts and new beginnings are available to you too! If you have never set up a budget, take one month and write down everything you spend. You can use an excel spreadsheet or paper. It doesn’t matter. Just pay attention! At the end of the month, tally up all your weekly spending from each category and see how much you are spending? Remember, budgeting is about charting a course. What do you see? You don’t know how to chart a course if you don’t know where you are starting from. Look at your current spending and income situation. What could you change or adjust to help you reach those big goals you wrote down? If you keep at the same pace of spending for the next year, will you hit your goals and dreams? If not, what things can your change to get you there? We have found using budgeting percentages to be an easy way to set up a budget. We detail our process here. In most cases, these percentages can be low. This is just a tool, not a law for spending! If you really want to stick with your budget, surround yourself with like-minded people. We have found Financial Peace to be an excellent way to stay focused and reach our goals. Ramsey Solutions offers excellent teaching and advice from paying off debt to building wealth. We can’t say enough great things about what they do. You need a good plan. We do recommend paying off all of your debt. We followed the baby steps and paid off all our debt (including our home) in 10 years. We couldn’t have done that without a good plan. Dave Ramsey’s radio show kept us going when things looked bleak. Listening to other people like us get their financial life together and be debt free was inspiring! My spouse/partner/ significant other is not on board with budgeting. What should I do? Instead of complaining or criticizing, start with dreaming. Ask your spouse or partner what they want for your life. How much money do they want to make? Do they dream of traveling or giving large money away to a charity they love? Work together toward a common dream. Instead of focusing on what your partner isn’t doing, try focusing on what YOU can do to get towards that big goal. Communicate regularly about your money. We always recommend that both parties be involved in paying bills and budgeting money. Seek a counselor if need be. Working on your relationship matters. If you need help communicating or working through conflict, ask for help from a professional. Many money problems are really relationship problems that surface through money issues. Sitting with a professional counselor can be really helpful if you feel stuck. I like expensive things. I don’t want to limit my life. Will a budget work for me? Who doesn’t love expensive things! I’m with you. I promise you it will mean more to you. Make sure your purchases align with your big financial goals. Sometimes, we have to put off buying something expensive until we can afford it. Following the baby steps has really helped us to learn how to delay pleasure until we reach our goals. Then, we happily save up and pay cash for something we want! We can’t cover the bills we have. We have too much debt. I feel hopeless. What should we do? First of all, we’ve been there. The days are long and hope feels like a distant memory. Remember life is all about seasons and seasons don’t last forever. Food, Shelter, and Clothing come first on your bills. Track your spending and try to find any holes in your budget. Can you cut back anywhere? Do that. Get creative with increasing your income if you need too. It doesn’t have to be forever, just until you get your debts paid. Finally and most importantly, find a Financial Peace University class near you. Surround yourself with people who can encourage you and help you! It matters! Our income is inconsistent. What is the best way to stay current on our bills AND pay down debt? Inconsistent income is an issue for us as well. In years past, it kept us from gaining any traction of our financial goals. I find a lot of great information about making budgets but I find they rarely work for those of us whose pay varies from month to month. Make a budget each month. We sit down each month and add up all our income streams. We know what we have to work with each month. We set a budget and track spending. We use budgeting percentages to set our budget. Set yearly goals. We sit down at the beginning of each year and agree on what trips we will take and what house projects need to be done. We rank them in order from the first priority to last. Any bonuses or large sums of money we make throughout the year go to those big projects. Talk about your income. We have specific goals on income from year to year. We know about how much we need to bring each month to make ends meet. We also know how much we’d like our income to grow in the next 5 to 10 years. I think this helps us stay positive and pushes us to manage the income we have today wisely. The goal is always the same for us. Progress over Perfection. I’m just overwhelmed with kids, work, home, and life. How do I add more thing to my plate? I”m with you. I have three kids, a job, and a husband in full-time ministry. Life is full. Start small. Pick one thing you can do today and do that. Don’t try to overhaul your life all at once. Do the next right thing. I am the one who buys all the food at our house, so I started with our food budget. I learned to meal plan and started buying 90% of our food from Aldi. Instantly, we started spending less money on food and I was able to use that extra money to pay down debt! I was so motivated by what I learned I cut back on other things in my life so I could help my family be debt free. For me, that looks like saying no to a lot of commitments outside our home. My kids help out regularly around our home cooking meals, doing laundry, and cleaning so I can have more time. This didn't’ happen overnight for me. It was a process. Give yourself some time. Ask for help! There is so much financial advice out there. How do I know what to listen too? I agree. I can be confusing. We can’t say enough good things about Financial Peace. It explains how to manage your money in a way that everyone can understand. It changed our life. We started the baby steps in 2008. We paid off $18,000 in debt in 18 months. In 2018, we made the final payment on our mortgage! Related: Free Debt Free Worksheets! I know this is a lot of information. Start dreaming about your life. Write those things down. Instead of self-editing, allow yourself to dream a little more. Use a budget as a map to those big dreams! Get help if you need to. Financial Peace is a fantastic resource. More than anything, think big and act small. Doing little things every day can move you towards any big goal, including budgeting! Subscribe for FREE AND get instant access to my resource library full of printables and tutorials. Once subscribed I will send you a newsletter about new files I’ve added. Committing to pay off your credit cards is a huge decision! Credit card debt is so common that many people don’t even take the time to think what life would be like without it! Maybe you stumbled into paying off credit card debt by working through the baby steps like we did. Or maybe your big goal for this year is to get your finances organized. Good for you! Keeping your goals in the front of your mind will motivate you to keep going. We are big believers in setting crazy goals. You know, those things you want but think may NEVER happen. We like those kind of goals. And one way we have found to make those crazy goals a reality is to remind ourselves of those big, crazy, ridiculous goals as often as can. It works. 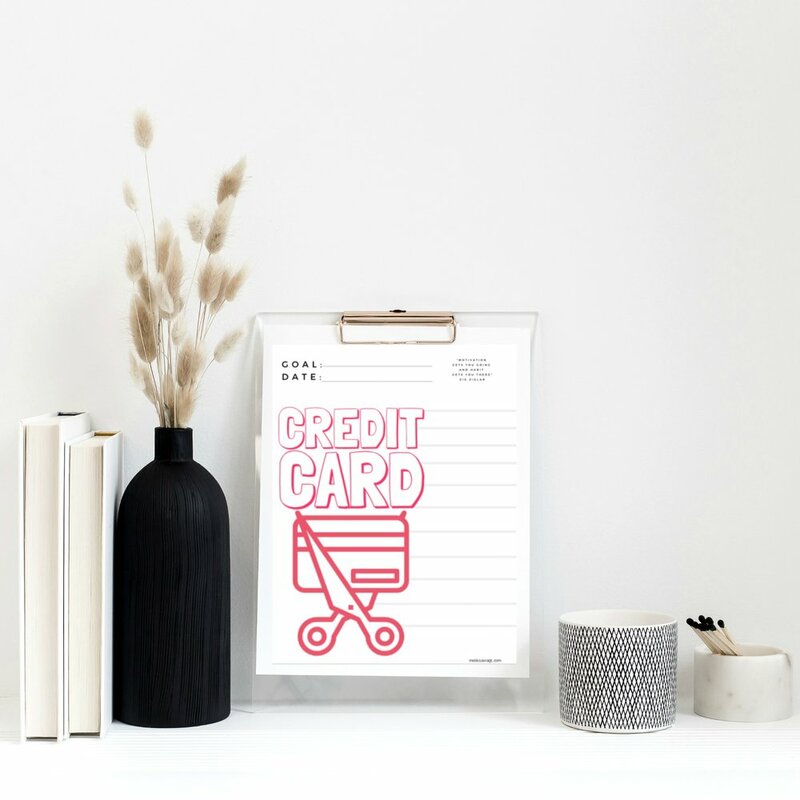 This is why we created debt free printables. 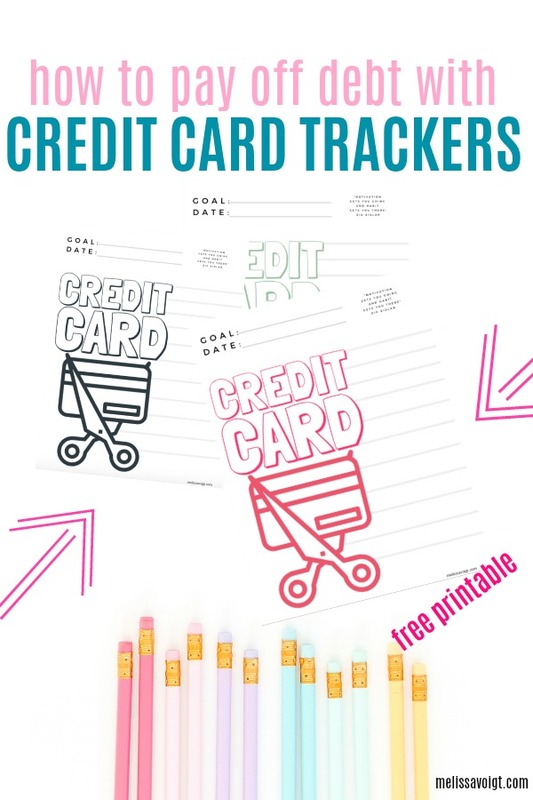 Our credit card printable is one of many debt free trackers we make and give away for free. We want to help you reach your big goals! Want to see how to get the most of our this printable? Here is what we recommend. To print this tracker and use it to pay off your credit cards, you’ll need to gather up the following things. Printer. We currently have this one. Our Credit Card Debt Tracker. Available for free below or inside our library or subscribe below and get instant access! Highlighters, Markers, or Colored Pencils to track your progress. Subscribe for FREE AND get instant access to my FREE credit card debt trackers. Once subscribed I will send you a newsletter about new files and printables I’ve added. You can use our trackers many different ways. Be creative and do what works for you! The beauty of paying off your debt is that you can go about a hundred different ways. The same is true for our trackers. 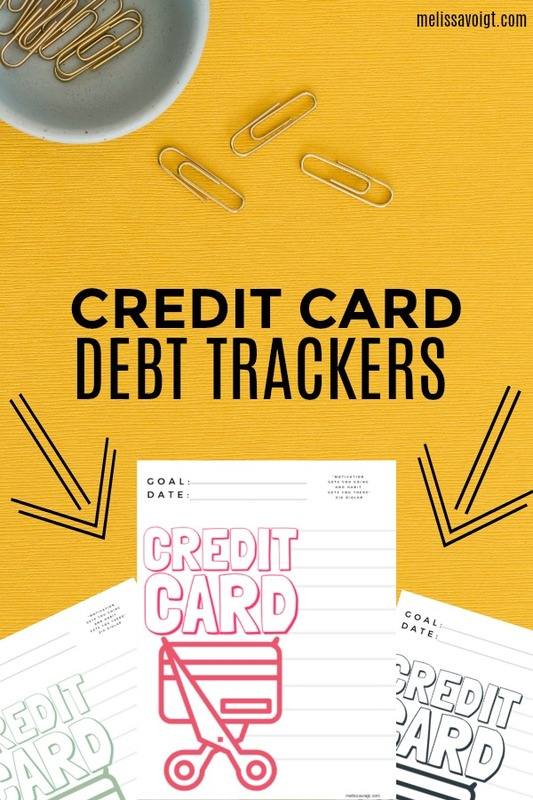 One way you could use this tracker is the take the total amount of debt you have on ONE credit card. Write that amount on the top of the page next to “GOAL". Decide when you want to have this particular debt paid. It’s tempting to skip this step but we encourage you to set a time limit. What month and year will you be done paying down this debt? You’ll notice our trackers has 11 different light grey hash marks down the right margin. The top line could be the total of one card. For example, let’s say you owe $10,000 on one Visa Card. You would write $10,000 on the top grey hash. The middle grey line under the word “CARD” could be your half way point. You could write $5,000 there. Fill in the rest of the hash marks in $1,000 increments. As you make progress you will color in your chart from the bottom up. When you have completely paid all of your Visa, the entire chart will be filled in. We recommend using one chart per credit card. We started using the baby steps in 2008. We paid off $18,000 in credit card debt, car loans, and then paid off our mortgage. This took us lots of time and dedication, but we did it. We stayed focused by setting goals and assigning dates of when we would accomplish each goal. Of course, it didn’t always to according to plan, but we stuck with it. We are big believers in keeping your goals and dreams front in center and talking about them often. This is why we LOVE making free trackers! We recommend the baby steps for anyone looking to get control of there financial situation. We use our cash envelope wallet to stay on track. We shop at Aldi to keep our food budget under control. In fact, we have many Aldi resources here to help you! NEED MORE HELP? CHECK OUT OUR OTHER TRACKERS BELOW. THEY ARE FREE!